Distance running is a fickle sport. The return on your investment in training is often delayed and your patience is often tested. Injuries, illness, and overtraining can hamper months of dedication and result in utter confusion and frustration. In my 15 years of being involved in the sport I’ve had a love-hate Relationship with Distance Running. However, I wanted to outline “the secret” to long-term improvement in the sport (and what has kept me this somewhat abusive relationship for so long): Consistency in Training! From getting the flu to becoming iron-deficient, any hindrance to your health is going to have a major impact on your running. Health is always a #1 priority and I’ve seen countless seasons and even careers ruined from anemia, anorexia, mental “burn-out,” sleep deprivation, and mono. If you’re not healthy you’re not going to run your best…simple as that! *Please consult a sports medicine doctor with a background in nutrition. I am not a doctor. This advice is only my suggestion…which is my opinion…and it is not meant to cure, treat, or prevent any disease! The mental side of things… you can say it’s the most important side of things.. (but I will tell you from personal experience that if you have iron-deficiency anemia no amount of willpower and/or mental toughness is going to get you through the acute build-up of lactic acid that painfully slows you down after the first mile of a positive split 5k). This is the self-discipline it takes to get out the door and put in very un-glorious miles on days when it’s cold, dark and rainy out. It is the intrinsic drive that compels you to seek self-improvement even when facing adversity from fatigue and other commitments in your life. It’s grinding out miles on a hotel gym treadmill at 10pm at night after traveling for work all day…. 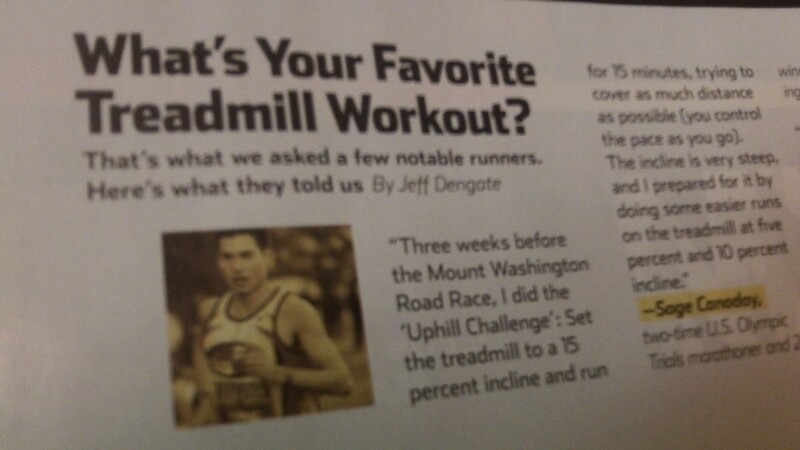 Sage talks about his favortie treadmill workout in the latest issue of Runner’s World Magazine! And finally, it’s also about gutting through speed workouts, tempo runs, long runs and races when your legs become stiff , you have a side stitch, and the copper-like taste of lactic acid burns in your mouth! Your whole attitude towards training and your commitment to progress will have a drastic effect on your performance and future in the sport. Patience is also a virtue. Train too hard and/or too fast and you get hurt; If you get hurt you obviously can’t run; If you’re not running you’re not improving. The solution: Back off right before you start to get hurt and find out why you get hurt (coaches and doctors can help with this as well as fellow runners who’ve been there). Also, train at a level that stresses you, but a stress just below your breaking point. That’s one reason to “train smart” and ties into this whole consistency theme…. Of course this aspect of Consistent Training” can be very complex and it is why Coaches who offer customized training programs (which I believe are ideal) charge so much! So there you have it.. The Secret is “Consistency, Consistency, Consistency!” Your fitness as a runner can build for years and years and years and this is the key to long-term success and improvement. I think a big part of the reason I was able to quickly transition up to running 100km trail races from just running road marathons was that I averaged about 90 miles a week for 5 consecutive years. I think I was better off doing that than hitting 140 miles a week for a couple months at a time and then getting a stress fracture and “running” 0 miles week for a couple months at a time. Also I took a lot of 4-5 day breaks from running after racing marathons and I ran a lot of miles at a pace 2-minutes plus/mile slower than my marathon race pace in training. I tired my best to listen to my body and I got my blood drawn every 6 months. It’s still a constant challenge for me (and I think every coach and athlete no matter how experienced they are) to find the ideal balance for improvement in running as it ‘s always going to be a moving target! So go out and find your own balance in training consistently…it may take awhile, but once you do it’s a great thing! I’ve been following your videos, reading articles and trying to incorporate whatever I can to my best. I started running at the age of 28 and you are one of the individual who always inspire me. It has been of great help. Thank you for keeping ignorant people like me, well informed. I look forward for your future advices. Hey thanks for following! That is great to hear and I’m happy that you’ve found my training advice helpful. Best of luck with your running and stay tuned for more blog posts and videos! I was reading an article and could relate to high mileage running as base training. Somewhat goes together if I’m correlating your Training Talk #2 with this article. Whenever you get few minutes, please share your feedback. GREAT post Sage! I enjoyed reading it and it has great reminders! Thanks Ariana! 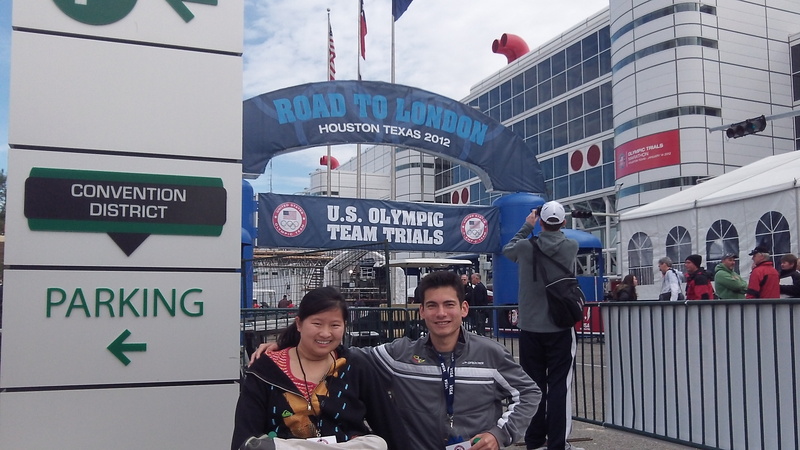 I enjoyed your post about Florida training and getting ready for Boston. Great advice, Sage! Thanks for taking the time to write it out and share it. Hope you are able to stay healthy and have another standout year! hey thanks man! hope to see you around at a race – congrats on the recent win! Great advice as always. Can you comment on how you recover after a hard workout? Despite the within 15 min carbs plus protein and a normal meal within an hour later I still have that toasty hungry feeling. hey thanks man! eat a big meal with some protein in it about 1.5 hours later. 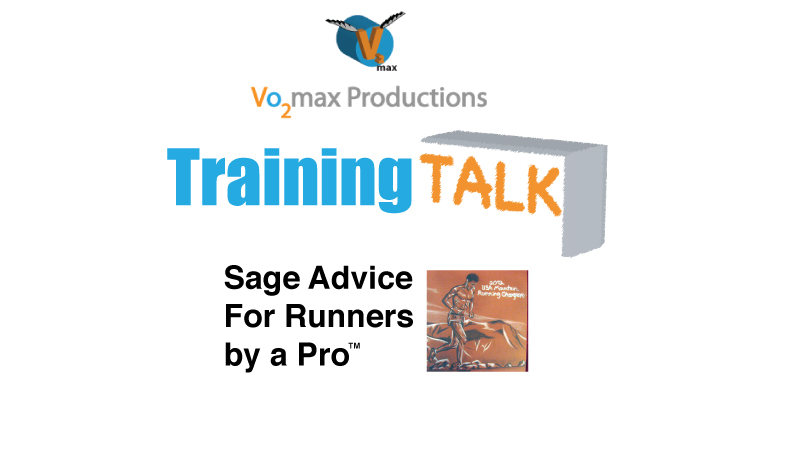 hey sage – so grateful for all that you share with the running community! quick question for you – i’m prepping for a marathon on may 5, and basically following the hansons training plan. i’d like to put in a 26.2k simulator in there, and am looking at april 14 to do that. does that timing sound decent to you (knowing that you’ve had experience running simulators with the hansons)? is it too late in the training cycle? hey- thannks for the support! I’d try to do it about a week earlier. A lot of times we ran the simulator too fast so be careful with that. It really depends on your mileage and what kind of long runs you are hitting. Best of luck! that helps a lot sage – i really appreciate that. i’m just now hitting about 65 mi/wk, with the 16 mi. long run – hopefully running the simulator will tie in nicely! Absolutely spot on advice – as someone who only this season started training ‘properly’ and is adapting to a more vegetarian diet, a lot of what you say here resonates extremely well with me. Consistency is key – and I can’t say enough about listening to your body. what is your reason for avoiding meat? 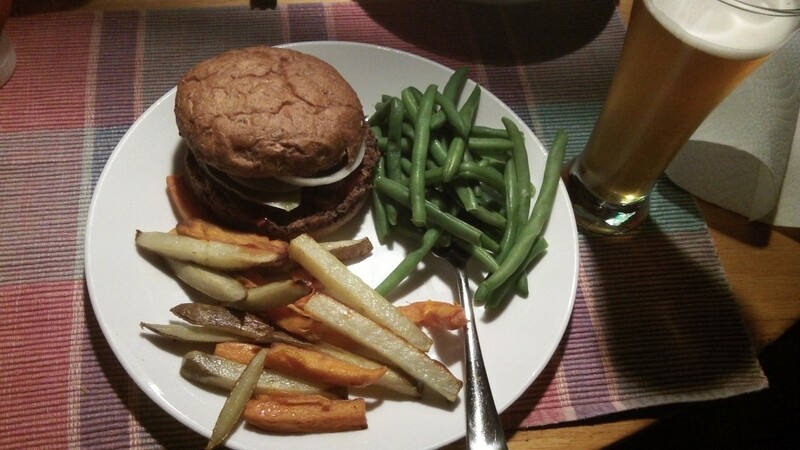 i grew up without meat. I don’t like the taste and don’t feel like I’m missing out. There are plenty of healthy options and diets out there though. 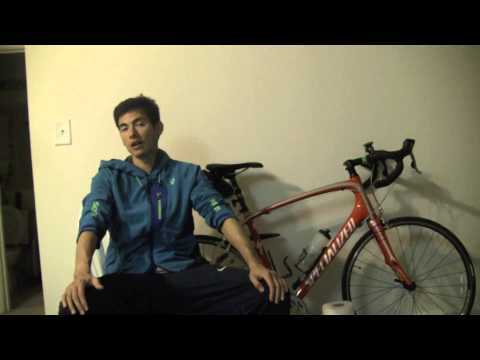 « Video Log Entry: Tarawera 100k Training and Animal Sighting!